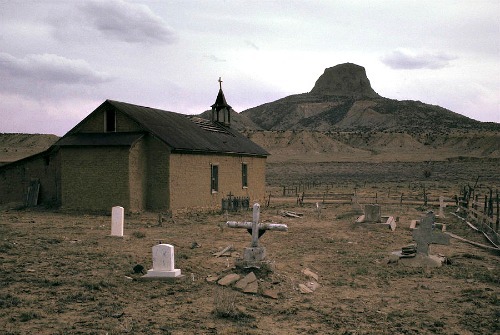 Is Cabezon Ghost Town Haunted? Cabezon is one of the few ghost towns that wasn't started as a mining settlement. Normally places like this have an abundance of minerals such as metal ore or a particular type of stone, but the area is thought to be completely bare of natural resources. The reason the town started in the first place back in the 1870's, was simply because there was a huge amount of flat grazing land and it was half way between the two other nearest towns. The town was an important stage stop between Santa Fe and a military outpost called Fort Wingate, and became a very popular place to stay on peoples travels. The town grew with the usual saloons and stores, and had its own school house and blacksmith, but its main function was to raise as many sheep and cattle as possible. The towns most prominent citizen was a man named Richard Heller, who was the the owner of one of the towns stores as well as its post office. He was the main figure head of the town and responsible for a large portion of its growth, by funding building projects and creating jobs. The town did very well in its day, creating comfortable living and jobs, but things changed after the death of Mr. Heller, affecting many people's incomes. The death sentence for the town came in 1947 when the local water source, the Rio Puerco dried up, and since there was nothing else in the area worth staying for the people started to quickly leave. The post office closed in 1949 and the last few residents left soon after, leaving the town completely abandoned. Today there are only a few remaining shells of the many buildings which once stood here, but please note that what does still remain is on private property and there is absolutely no trespassing, but you can still get a good look at the buildings from behind the fence. Any place that is known as a ghost town is usually thought to be haunted, and Calbezon is certainly no exception. As you can imagine all of the ghosts in the area are believed to be from the townsfolk that lived here, though there were certainly not as many deaths as somewhere such as a mining town. There are the usual stories of people who died here in typical circumstances, such as general accidents and gun fights outside the saloons, with the later being a little more common than usual here due to the high number of military personnel coming through and getting drunk around the locals. Reports of ghostly activity are quite typical for such a location as this, with stories of apparitions of cowboys being seen in the area and the capture of orbs and strange mists on film. There is also an old Navajo Legend about the huge volcanic cap which today is simply known as Calbezon, since the town is now redundant, which tells of how it is the head of a giant slain by the gods.